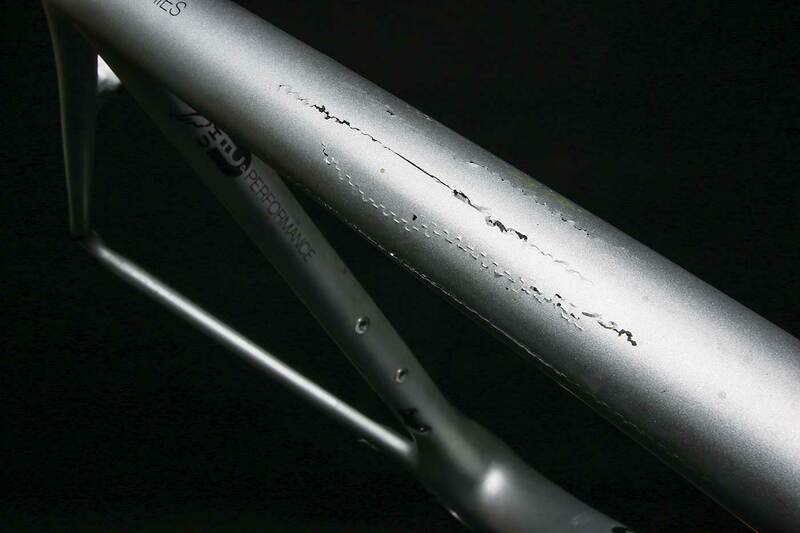 We’re talking of course about cracked carbon frames from clamping work stands. It’s an unreported menace in cycling, striking when you least expect it. Sometimes it’s a big “crack and fail” as you reef on a stuck crank arm; other times it’s just repeated clamping, slowly breaking down the resin between fibers. These clamps, remember, were originally designed for steel tubes. How big an issue is it? Check out any race hotel after the finish. 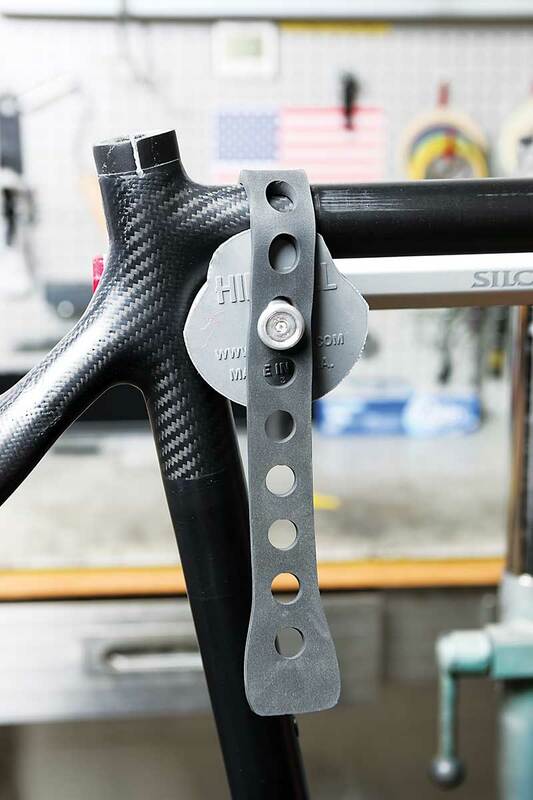 Essentially, every mechanic is using a dropout-style stand, one that holds the bike by the front dropout, not a frame clamp. In fact, according to SILCA, the Bora-Hansgrohe team mechanics are explicitly forbidden in their contracts from using clamping stands. It’s a fireable offense. After eight years in business, Rukus has seen literally hundreds of frames with this kind of clamp-based damage. Small expects the number is actually much larger, but they don’t always get the full story behind how frame damage was done. 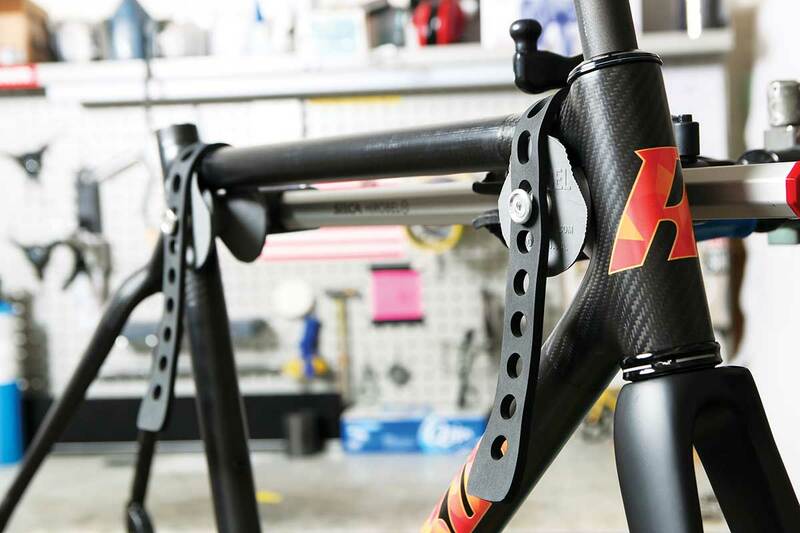 To repair today’s carbon frames right is a painstaking process. Rukus uses ultrasound to detect damage down to 0.001mm. The area is stabilized by removing all of the damaged material, then the Rukus engineers will actually recreate the damaged layup with the appropriate carbon modulus, sometimes even improving it. After that, the repair is pressurized, then cast and cured through an extended heat cycle. Finally it’s paint—paint so good the repair will be invisible. “We have yet to come across a paint job we couldn’t recreate,” said Small. To repair this kind of damage means stripping your bike down, shipping it off, being without your ride for two weeks and paying an average of $500 for the repair. We don’t mean to take food off the Rukus table, but maybe there’s a way to prevent the damage to begin with and still utilize the convenience of a clamping stand? Trust the guys at SILCA to find a way. SILCA has made a habit of turning the pedestrian into the sought-after with its Super Pista pump, hex keys, saddlebags and more. 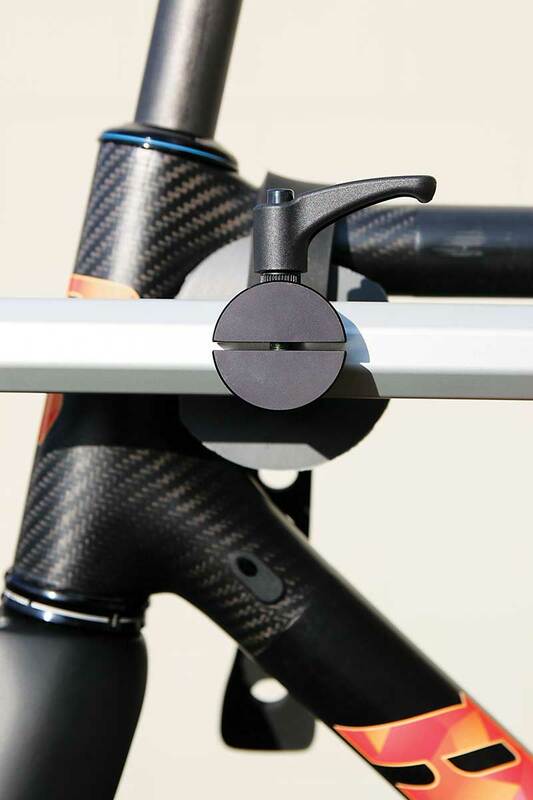 Now, with some help from a start-up called Hirobel, the company is taking up the hidden scourge of frame damage from clamping stands. SILCA didn’t create the Hirobel; that was Brandon Hirokawa and Marc Bellett. Hirokawa was a shop rat from way back and always fascinated with mechanics and processes. The idea came from watching bike after bike get clamped down in a stand at a triathlon bike check. “I remember thinking how reckless that was, and that thought just stuck in my head” he said. The result is Hirobel—a combo name of Hirokawa and Bellett. It’s a simple device that at first glance appears to be designed for a cross-fit workout, but it cradles carbon tubes without clamping yet provides a solid foundation for wrenching. It doesn’t replace the stand clamp, but works with it. An aluminum tube has rubber bumpers and quick-release straps on each end. Clamp the tube down securely in your stand and cradle your bike gently in the bumpers, strapped down with the rubber straps. The bumpers are adjustable to ensure a TT bike, MTB, road bike or even a kid’s bike will fit. Simple and incredibly effective. Like any start-up, Hirobel faced an uphill battle despite the product’s effectiveness and, perhaps not well understood, need. As the recent aluminum tariffs took effect, Hirokawa saw his raw-material price go up 200 percent. Hirobel just wasn’t a big enough player to negotiate reasonable pricing. Hirokawa knew he needed to get creative if Hirobel were to survive. 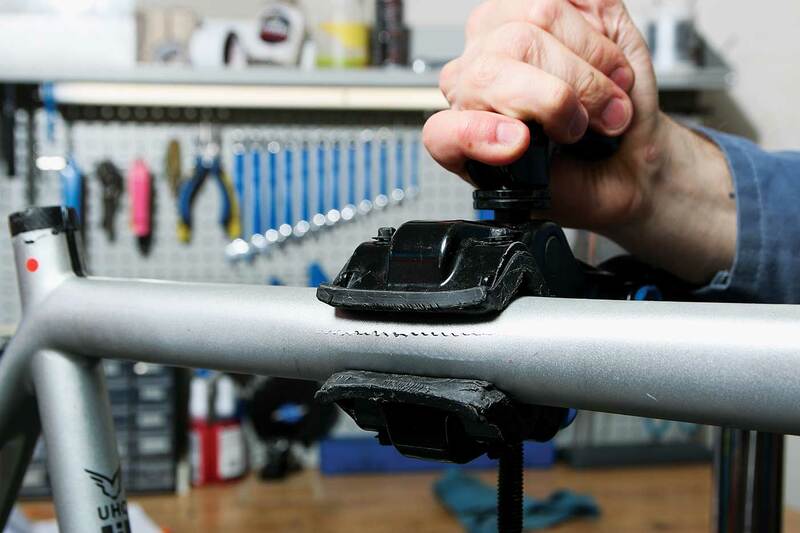 Poertner, with decades of experience in cycling and working closely with pro mechanics during his days at Zipp and now as a technical provider to Bora-Hansgrohe, knew the dangers of work-stand clamps on thin carbon tubes and saw the potential immediately. With SILCA’s purchasing agreements and manufacturing ability, it could also solve many of Hirobel’s logistics and purchasing problems. Manufacturing is going in house with SILCA in Indianapolis and the price of the Hirobel will actually be reduced, from $250 to $185. It’s not cheap, but it’s a lot less than getting your carbon bike repaired, plus it provides a more stable platform to work on your bike. There’s no question, Hirobel and SILCA enjoy plenty of, shall we say, synergy. Hirokawa has now gone in house at SILCA along with his Hirobel. He has many more ideas in the pipeline and with SILCA’s capabilities and Poertner at the helm, we imagine it will be a fruitful relationship. From issue 84. Buy it here.